This is a restaurant with an attached bar that overlooks the bay area of Noia. It is situated on the first floor of one of two apartment buildings in this zone that also have bars on the ground floor level. The restaurant's canopy and name are on display at the front of the building, but the entrance is to the rear. We were introduced to this restaurant last year by some friends from Portosin, but we visited it again this year (2009) and were equally impressed. San Marco is definitely a restaurant for a special night out and you can easily spend a lot of money (comparable with the UK, USA etc) on its a la carte style regional menu. 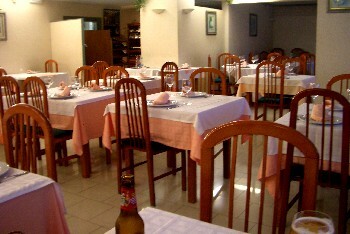 The restaurant has meat dishes, but it specialises in fish and seafood and, although not cheap, the portions are sizable and, based upon our two visits, the cuisine is of a high standard. The San Marco restaurant is traditionally laid out and has table cloths and napkins and it is used for weddings and banquets, so that should give you an indication of its typical clientele. Partly because of this it is rarely busy on week days. The down side to the San Marco is the fact that the owner and staff do not speak any English. However, they will go out of their way to be helpful and (with my wife fluent in Spanish) the owner explained in great detail how our (shared) main course was prepared. He also went out of his way in solving our desert selection dilemma by giving both of us a mix of the two different desserts that we struggled to decide between. All told the San Marco restaurant is a good dinning experience and you can always take a constitutional along the boardwalk after the meal if you want to work-off some calories.